When Pathé-EMI recorded this well nigh comprehensive Debussy set in 1973 and 1974 little did they think that the resulting tapes would have had such a long and productive shelf-life. Their investment must have been repaid many times over. Certainly they have been reissued and repackaged in numerous permutations over the years. The most recent was as an 8 CD EMI Classics box (CZS 5 75526 2) also including the four Ravel discs recorded by Martinon (but with the Orchestre de Paris) at the same time. Originally the Ravel and Debussy sets appeared in two substantial and opulently decadent HMV SLS boxes (Ravel SLS 5016 and Debussy SLS 893; 5 LPs in each). If I recall correctly each was adorned with a Bakst canvas - one of which was of Nijinsky as Debussy's faun. Here the Debussy recordings put in their most economical and elegantly utilitarian appearance yet - presumably the Ravel-Martinon set is to follow. Their intrinsic artistic and technical faculties are completely uncompromised although the packaging is spartan. The convenience of this single package at much less than Naxos price is only vied with by its many artistic delights. 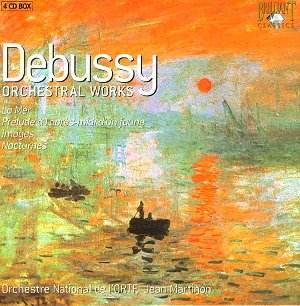 Martinon's Debussy is joyously liberated. Atmosphere and the recreation of front-to-back and left-to-right depth continues to work as well as on the original black discs. Of course these were performances taken down onto analogue stock yet aside from a subtle unassertive tape hiss, only audible when you drive the loudspeakers really hard, there are no grating results and nothing approaching distortion. Martinon was born in 1910 in Lyon. He studied in his home city and in Paris - latterly with d'Indy and Roussel. He played the violin in the Paris Conservatoire Orchestra. After further studies at the Sorbonne he worked with Munch and Désormière. In the Second World War he served with the French Army and was taken prisoner in 1940, spending two years in a POW camp. He escaped from the camp three times. While in captivity he wrote a symphony (the first of five), a motet Absolve domine in memory of French musicians who died in the war and a setting of Psalm 136 which became known as Chants des Captifs. Release in 1943 saw him appointed conductor of the Bordeaux orchestra and then, as assistant to Munch at the Paris Conservatoire Orchestra. He was principal conductor of the ORTF Orchestra from 1968 until his death. We tend to forget that the present recordings were made within a couple of years of Martinon's death in 1976 though there is no sign of a falling off in insight or energy. Martinon's elegance and sound technique were a byword in the profession. His interpretations are strong on clarity. He was mild of temperament and was not inclined to dive into the sort of blazing rows so relished by some conductors. His spell (1963-68) with the Chicago Symphony (immediately after the tyrannical Fritz Reiner) was unhappy. Martinon was split between factions including the antipathetic critic of the Chicago Tribune, Claudia Cassidy. He was relieved to leave and to return to the congenial locale of the Paris Orchestra and the ORTF. Martinon came to regret that he was so strongly associated with French music rather as Boult and Handley have been so tightly bound up with English music. Martinon hankered to conduct Mahler but death intervened. The Debussy and Ravel recordings are from Martinon's finest legacy. In them he shows a poignant mastery of pulse and orchestral balance; the latter especially important in the case of Debussy who can otherwise sound muddy. He directs an exciting La mer. In De l�aube at 08.38 the crashing climax illustrates the racing drama of this reading. Listen also to the priapic Scriabin-like trumpet at 00.51 in Dialogue du vent. I have heard sharper rhythmic drive in other hands but Martinon conjures a telling effect for his Nocturnes. The choir in Sirènes sounds almost casual rather than idyllic. Martinon�s Prélude a l'après midi d�un faune has the blood oozing through the veins. The warm flute of Alain Marion is a large part of the honeyed mesmeric quality Martinon achieves. The last time I heard something like this was in Serge Baudo�s Supraphon LP collection. Marche écossaise is a jolly oddity like the oddball march of a Scottish regiment complete with drone bagpipe imitation. The Lear music was written for André Antoine's production. Its long tragic march has Gabrieli-like trumpet and trombone �collisions� and a generally troubled atmosphere. This carries over into Berceuse héroïque which is pregnant with the sort of foreboding found in Miaskovsky�s Seventh and Tenth symphonies. Jeux was somewhat eclipsed at its premiere by Stravinsky�s Rite of Spring. It contains echoes of Dukas�s L�Apprenti sorcier. Martinon is much more striking in Images. His Gigues has delicacy and balance. Note the orotund brass in Par Les Rues Et Par Les Chemins. Parfums is somnolent and in Le matin d�un jour de fête one is aware of the careful balancing of dynamics. The fuzzy Printemps is rather under-powered. We rediscover freshness in Children's Corner with the captivating charm of Serenade for the Doll and the Charlot shuffle of Golliwog�s Cakewalk. In Petite Suite which is superlative light music the lovely En Bateau is taken quite quickly. I �learnt� Danse sacrée et danse profane from the recording by Paul Kuentz with the harpist Nicanor Zabaleta and although I recall that version as being closely recorded this one with the equally famous Jamet is similarly numinous - a recording of ineffable rapture. The Caplet orchestrated Boîte à Joujoux is memorable for the delicious dissonances of La Bergerie à vendre. The last of the four discs has the three concertante works and three other pieces. In the low key Fantaisie, an early work of easy whirling flourishing caprice, Ciccolini makes a sensitive soloist, but no concerto high jinks. The Premiere rhapsodie was a 1910 test piece for the Conservatoire and sketches out Debussy�s mature qualities in microcosm. The saxophone Rapsodie was a commissioned work which was taken from first draft (as far as Debussy got!) and orchestrated - and more - by Jean Roger-Ducasse (1873-1954). These works are pleasant listening but are not terribly memorable. La Plus Que Lente shows signs of central European gypsy style and is otherwise rather like Valse Triste. Khamma, an exotic ballet, was commissioned by Maud Allen in 1912. The story is of the dancing girl who sacrifices herself to save her city. It was orchestrated by Koechlin who at various times in his career had a weakness for oriental and middle-eastern fantasy; Les Heures Persanes is one of his best works. To bring us roundedly to the end we have the lively Tarantelle Styrienne which was orchestrated by Ravel. The booklet has the same full notes as the EMI CZS set from James Harding and these are in English only. The fold-out light card wallet holds each CD in its own card sleeve. The detailed track contents are listed only on these sleeves. As a single cornerstone to your collection which you might leave as the only Debussy entry for years you can hardly better this. What we now await are further licensed boxes of the complete orchestral music by Ravel, Fauré and Saint-Saëns. Is it too much to hope that this series will also eventually include the Nielsen orchestral works with Blomstedt and the Danish Radio Symphony Orchestra? Martinon, though he considered himself hobbled by his reputation as a Gallic specialist, makes a very strong showing indeed. Not only is this set of compelling artistic attraction it is kind to the bank balance and also takes up only a couple of centimetres of shelf space. The works are all opulently recorded, not especially analytical, but conveying the illusion of lifelike sound and palpable immediacy. At super-bargain price you need look no further; a gift that will cast its smiling spell for years to come.